The Hanriot HD.1 was a French World War I single seat fighter. Rejected for service with French squadrons in favour of the SPAD S.7, the type was supplied to the Belgians and the Italians with whom it proved highly successful. 831 of a total production of about 1200 were in fact produced by Italian companies under licence. The Hanriot company produced a series of pioneering monoplanes pre-war, but had settled down as a licence manufacturer, notably of Sopwith 1� strutters, when the HD.1 was produced in 1916. 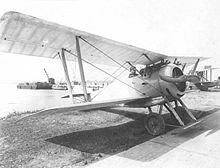 The type was a conventional fighter with the general characteristics of a typical Sopwith type, being strongly but lightly built, and combining clean lines with a light wing loading. In particular, it used the same “1�” (or "W") cabane strut arrangement as the Sopwith two seater. It had a flat lower wing - but the top wing had quite sharp dihedral. On the power of its 110 hp Le Rhone rotary it was not outstandingly fast, but it was very manoeuvrable and proved popular with pilots as a safe and pleasant aircraft to fly. To maintain a competitive climbing and altitude performance it proved necessary to restrict armament to a single synchronised Vickers gun, although two could be fitted, and occasionally were. The gun(s) were fitted to the side of the cockpit, and were accessible to the pilot without the butts being directly in front of his face in the event of a crash - an unusual but welcome feature. The type was also produced by the Nieuport-Macchi company of Varese, Italy, which built almost 900 HD.1s between 1917 and 1919, more than the parent firm. The new type was ordered into production as a possible replacement for the Nieuport 17, but became “surplus” when it was decided to replace the Nieuport with the SPAD S.7 in the French air service. Some were supplied to the French Navy, a few of which were eventually passed to the U.S. Navy - some naval Hanriots were converted to, or built as, floatplanes - with enlarged tail surfaces. The bulk of early production, however, was diverted to the Belgians, who notoriously had to make do with aircraft unwanted by their allies. With the Belgian fighter squadrons the HD.1 proved surprisingly successful - and the type remained the standard Belgian fighter for the rest of the war. Willy Coppens, the top Belgian ace of the war was the most successful HD.1 pilot. The type was also supplied in small numbers to the Italians - who manufactured it in quantity and used it to replace not only Nieuports but even SPADs in their service. The type was considered (by the Italians) to be a better all-round fighter than even the SPAD S.XIII and it became the standard Italian fighter - equipping 16 of the 18 operational Italian fighter squadrons by November 1918. After the war the Swiss Air Force used Hanriot HD.1s - and ten were built (or possibly modified/converted) by the U.S. Naval Aircraft Factory. The U.S. Navy machines were mainly used as trainers, although they were also involved in experiments with takeoff platforms on warships; they could be fitted with twin guns, and at least one machine had a hydrovane and flotation bags of the type developed for the Royal Navy (see illustration). Data from Holmes, 2005. p 31. Holmes, Tony (2005). Jane's Vintage Aircraft Recognition Guide. London: Harper Collins. ISBN 0 0071 9292 4. Hanriot HD.1 Pictures and Hanriot HD.1 for Sale.